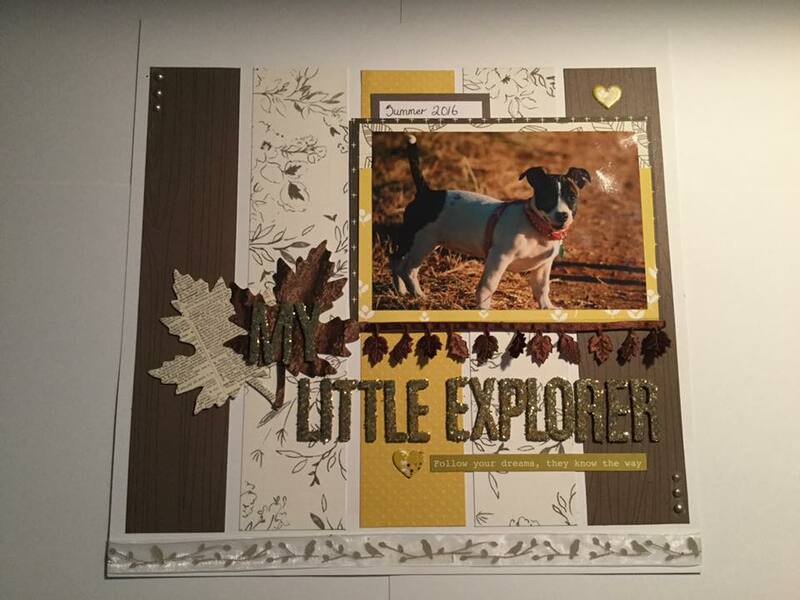 Hey everyone , my names Laura I've loved using the Hazel September /October custom cards kit. 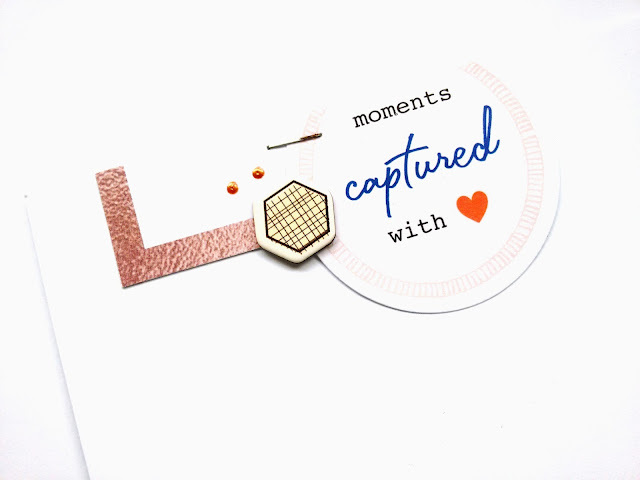 Its so versatile whether you do pocket scrapbooking, traditional layouts or mini albums this kit works for all. This first layout I have made is an A4 layout. I've used a picture of my cat Millie who is my baby ! I currently document using project life and my Travelersnotebook. 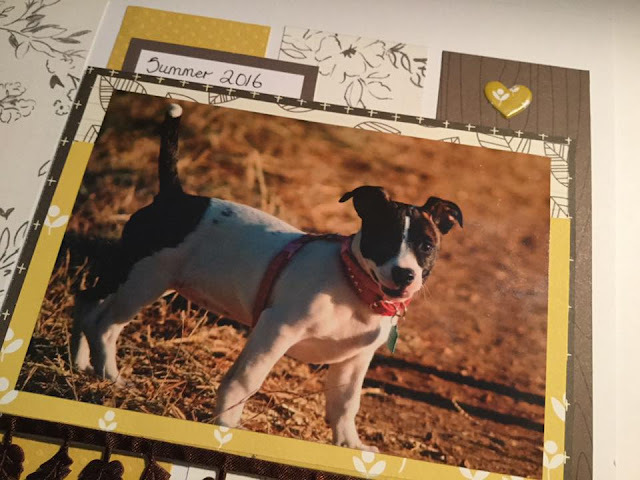 My project life album for 2016 is 9x12 size so I have created various different sized layouts this year. I made this layout using the journal cards from the Hazel kit which I cut down to layer my photograph. 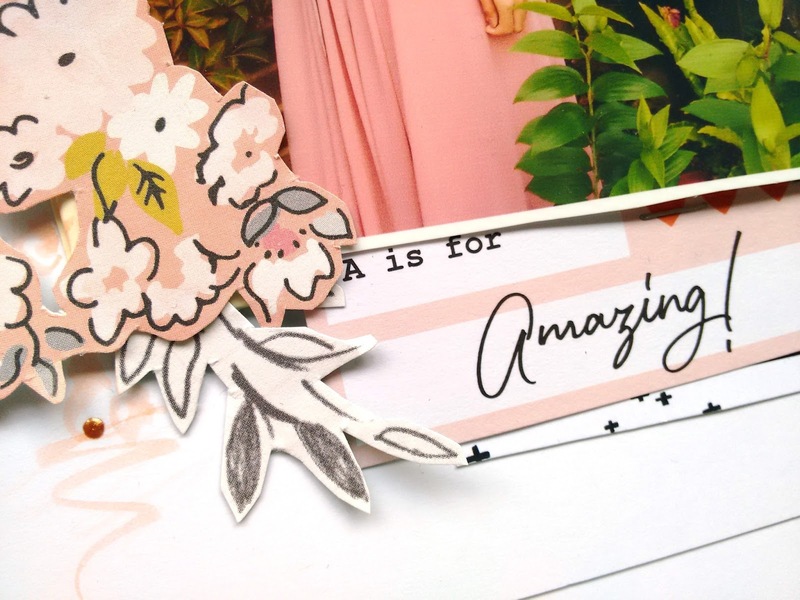 I also cut down one of the 6x4 cards to make an embellishment from the wording "my favourite"
I used some crate paper stickers for the wording "adorable". To finish I cut apart another two of the cards one for the black and white design which I then used to matt the october card. As a little extra to bring the layout together I added some pen detail around the edges. 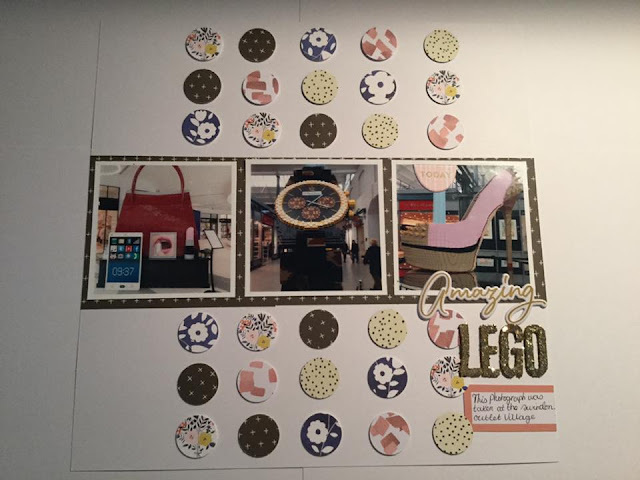 Before I laid anything down on the paper I looked at my photo's of the Lego statues that I'd taken in Swindon's Outlet Village, and thought hmm I want to make a lego like effect..so I grabbed my 1 inch circle punch and started punching pieces from all the papers listed above. The pink and white circles were actually punched out of one of the 4x6 cards from the Hazel set. To create this look you will need 6 of each pattern you choose to use to make three lines of five circles. After I'd punched them all I popped them all up on thin double sided pads, I didn't want them too high, just to give a little dimension and to resemble the look of Lego. 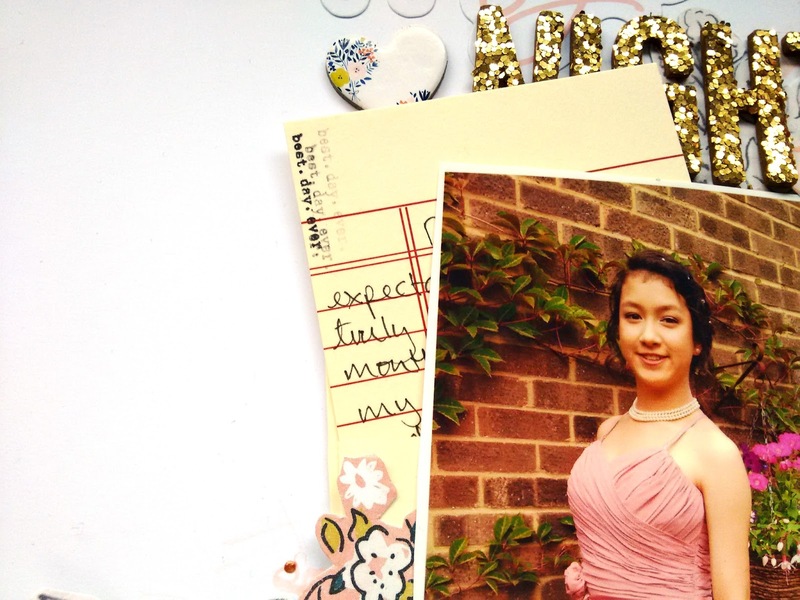 I backed my photo's onto The Reset Girl Speckle paper (the dark plus sign side) to make them stand out from the rest of the patterned papers. When it came to choosing my title I knew I wanted Lego in it somewhere, but I hit a wall cause I had no L's left! Oh No! What do I do?? I turned a number 7 upside down of course and to be honest you really can't tell... hehe now that's what I call crafty! I used the Amazing puffy sticker from the Studio Puffs for the rest of my title and added the Today puffy sticker directly onto the photo. I Finished off an already very busy layout with a simple but pretty cut-apart label sticker so I could journal where the photo's were taken...and that's it! Nice simple, easy, but effective layout. Hey guys, I'm Alice and I'm a new member of the Quirky Design Team! I'm very excited to bring you my first layout using the 'Willow' kit and 'Ash' embellishment kit, with a photo of me in my prom dress. I have other photos (still to scrap) to further document the 'story' of the evening so this was more of a general layout to encompass the emotions and atmosphere of my Year 11 prom. I wanted it to be light and pretty and I wanted to emphasise my pink dress. I fussy cut some fiddly clusters of flowers from 'Kate' and 'So Sweet' from the Crate Paper Gather collection to frame the photo and add some depth and texture. I also used a coloured pencil and water brush behind them to bring in some more detail. 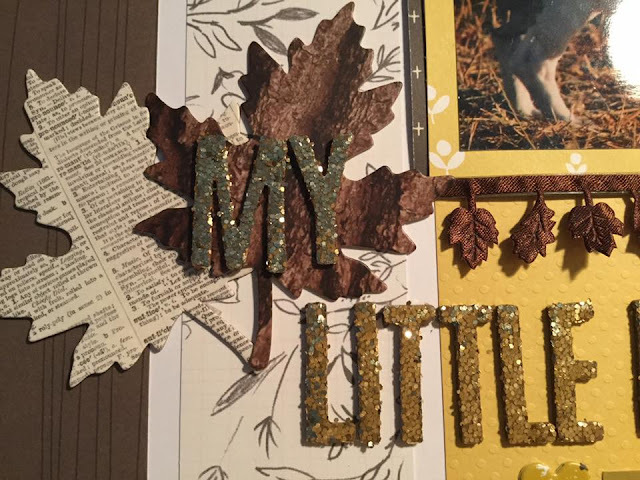 The gold Thickers and Copper Penny Nuvo drops are for extra sparkly pizzazz! I couldn't resist this Indigo Hills die cut since it was the perfect pink and used the first letter of my name. 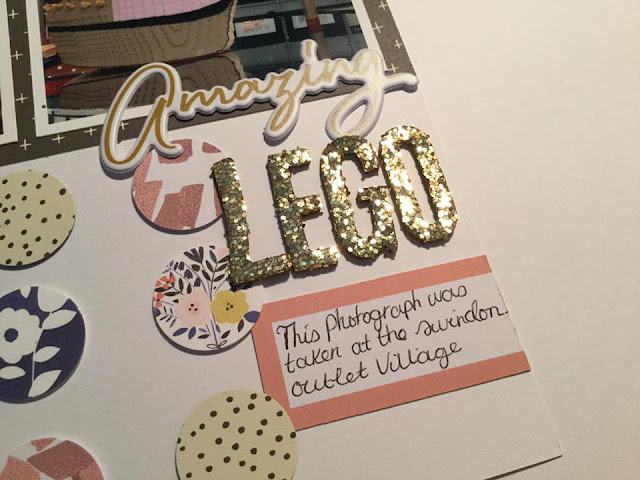 When I do layouts with the main cluster in one corner I like to balance it in the other corner; a label, die cut and Reset Girl chipboard sticker were great to stop the page looking too empty. As promised here I am, back with my second layout from this gorgeous kit. This time I wanted to make something a little Autumnal so I could use some of those beautiful autumn aspects that came with the kit. So without further ado, here is my layout and the items I used to create this look.. 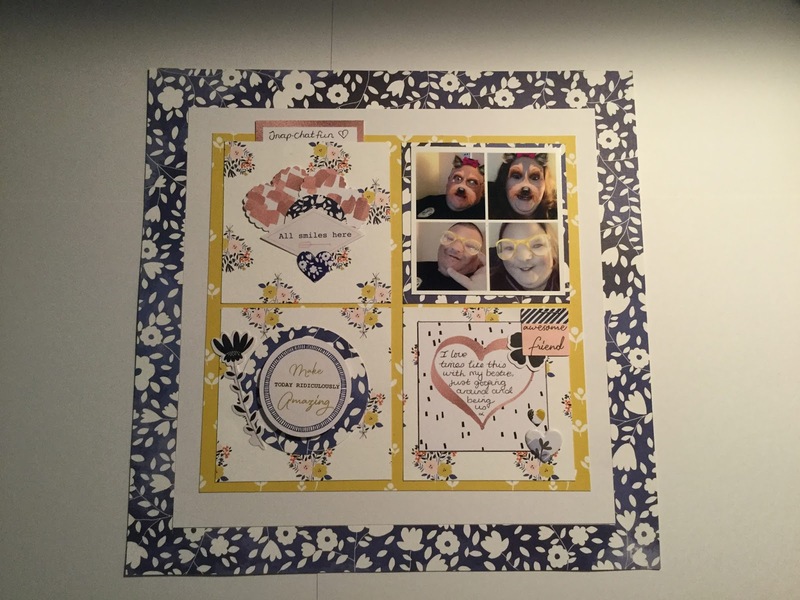 I was then just going to lay my photo on top and start embellishing, but I felt the photo need some layering because it was just blending into the background. So I used some scraps I had left from Piles of Smiles paper and Speckle paper, and also added a piece of the pinnacle paper. I placed some double sided tape at the back and added the cut apart label before adhering the whole thing to my layout. I then decided what I wanted to do with my title. I knew I wanted some of it to go underneath the photograph to "ground" it I guess you could call it, but I also wanted to use a couple of the Pebbles Warm & Cozy leaves..so I layered up 2 of the same shape (there were many different shapes in the pack). One newsprint type and one brown. 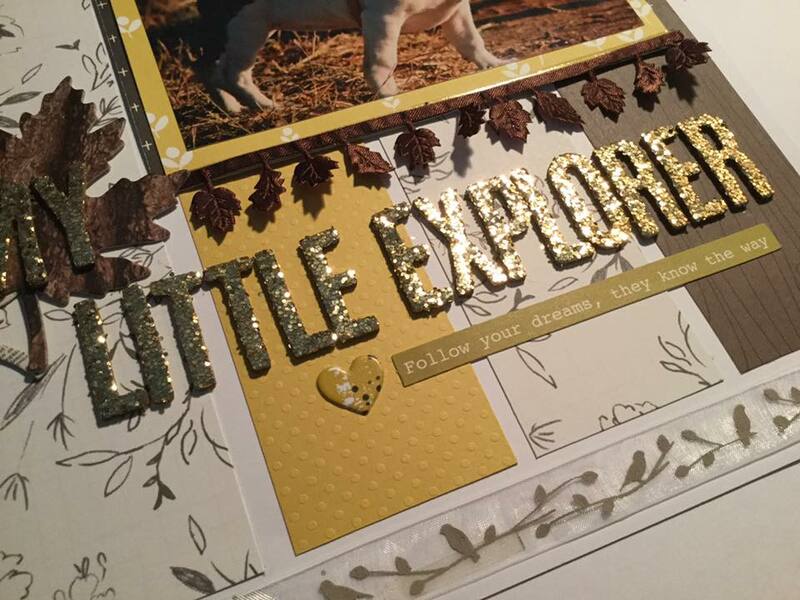 Adhered those to my layout and then put MY on top using the American Crafts Jen gold glitter Thickers...these are beautiful!!! I spelled Little Explorer with the rest and I love how It looks. To tie in with the leaf theme I used the diecut leaf ribbon and adhered this using some extra strong red tape as it is fabric and I really wanted it to stick for a long time. Look at how those Thickers sparkle! Isn't that ribbon gorgeous? I love it! By the time I had all these different elements happening on my page I decided it only needed a little embellishing so a simple phrase piece from the Indigo Hills was laid under the title alongside one of the puffy hearts from the same collection. I also added another puffy heart at the top and used my Antique Rose Nuvo Drops to add three little dots at the top and bottom corners diagonally. I decided I didn't like the 2" of white space at the bottom of my layout and felt it needed something delicate just to finish the layout off, so I used the bird organza ribbon and it did just what I wanted it to. 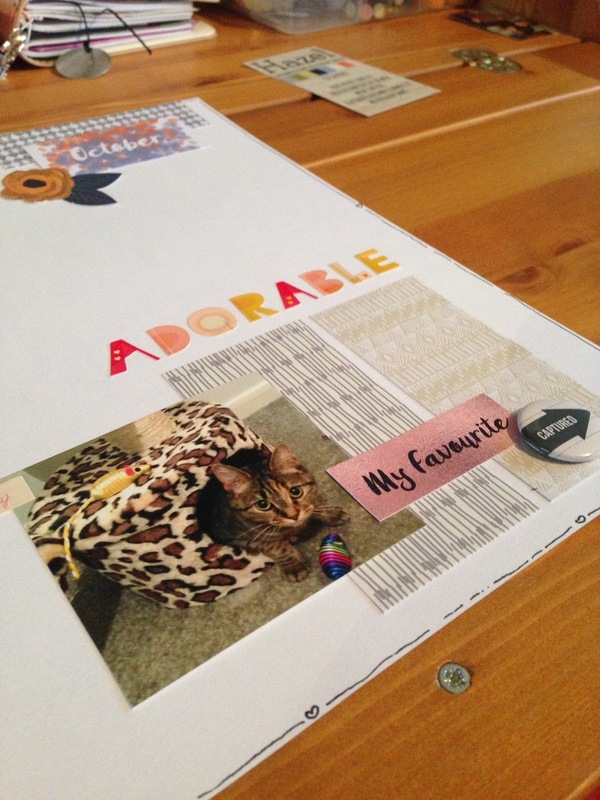 I love this layout and how it turned out, it's going to sit very pretty in my puppy's album and guess what??? You may see more puppy pictures coming up in future layouts because (drumroll please...) We are getting another puppy!!! Enya's half sister is coming to join our family this week! As you can probably imagine I am VERY excited! 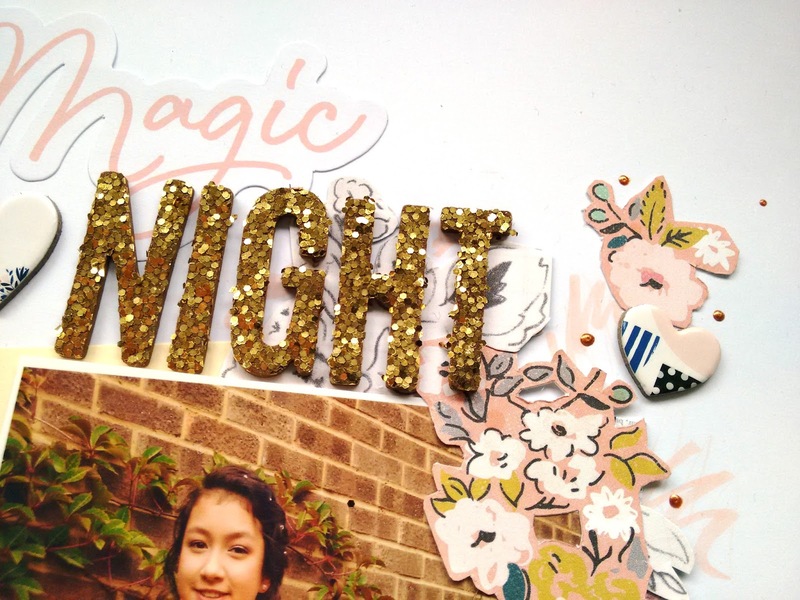 If you've created any layouts using these gorgeous elements, and your a subscriber to Quirky Kits... please head on over to the Quirky Kits Subscribers group on facebook and tag me in them. I would love to see what you create. Hey everyone I am back with another layout, this time using the new September/October kit! And here is how I created my first layout. After I'd done this I cut 3 just over four inch squares from the PFS Indigo Hills Moorland 12x12 Patterned Paper. With the spare piece of Blue Valley paper I had cut out of the middle I cut a just over four inch square with that also, to which I then adhered my photograph. 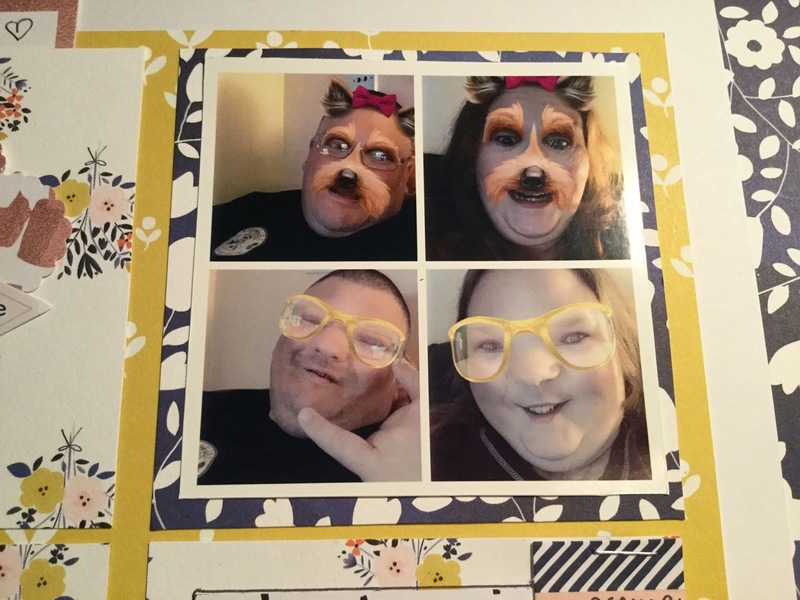 Silly pictures made on snapchat and then put into a four windowed grid using the Picstich App. 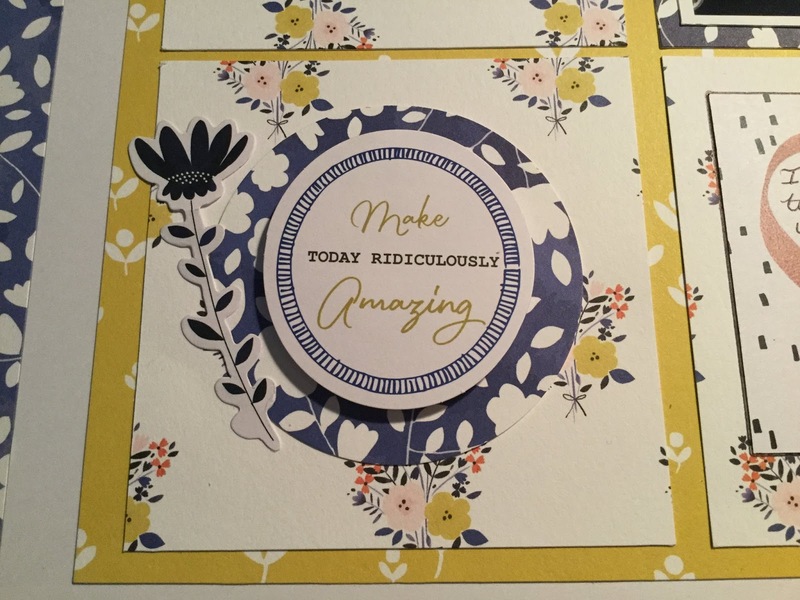 It was then time to embellish, so I started off by emptying out the Indigo Hills Die cut pack into a little tub and chose the circle piece that reads "make today ridiculously amazing" and used one of my circle punches to make the blue circle out of the blue valley paper again. I used a double sided sticky tab to give it some dimension. I finished this square with one of the flower die cuts. I finished this square off with the awesome friend die cut, the black flower die cut which I layered underneath that and some of the Indigo Hills Puffy Stickers. I stapled the awesome friend tag on to add a little texture. 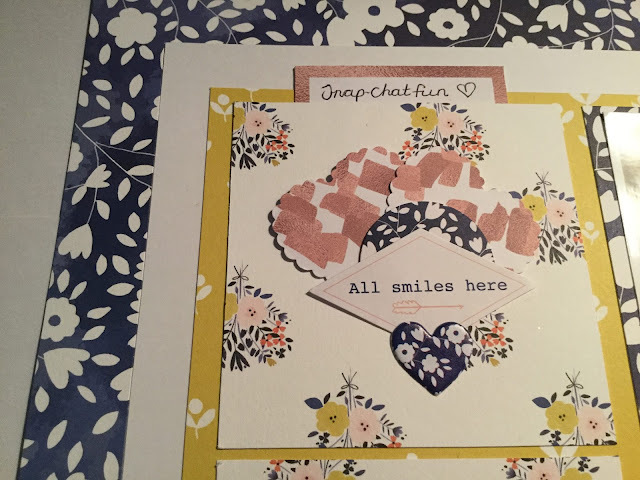 The last square was made by using a scalloped heart punch to cut out 2 hearts from one of the 6x4 cards from the custom card kit. 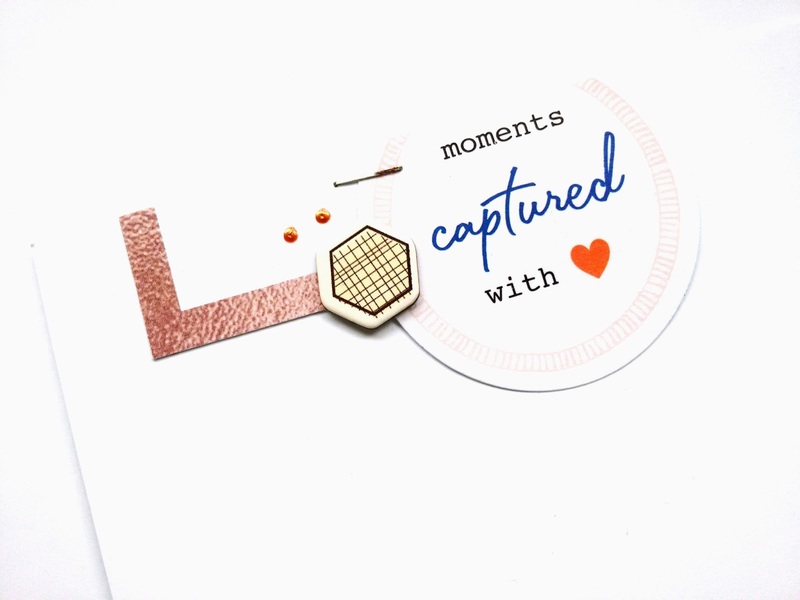 The blue circle and all smiles here are from the die cuts pack. I added a puffy heart sticker and finished off with one of the cut-apart labels and Voila!!! This layout came together so well and all the colours just go..I love it. Not really attempted a grid layout before but I thoroughly enjoyed this one and will attempt to make some more in the future! I will be back next week with my next layout. Here's hoping you all have a lovely weekend! Hey guys! 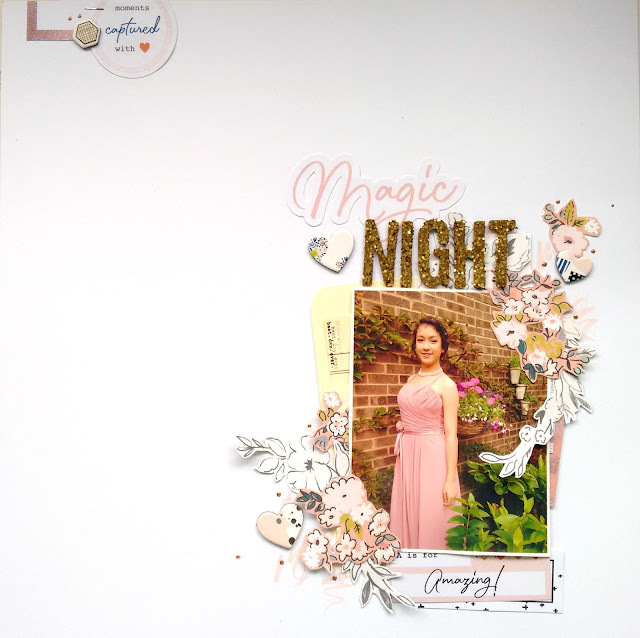 I am back with another layout using the July/August Quirky Kit. 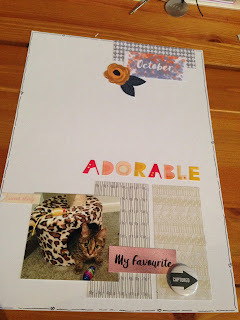 This time round I have a project life style layout for you. Before I begin to tell you how I did each card, I used the 12x12 My Minds Eye Hooray Celebrate cardstock as the base for all my cards cutting it into three strips of four inches, cutting two of those four inch strips to make four 6x4 cards and the left over strip to make four 3x4 cards. I started this card by adhearing two strips of the narrow dotted Reset Girl washi tape at the top and bottom of the card. I then spelled out Second Chance using the Freckled Fawn grey puffy alphas, Dog Show using the Dear Lizzy Good Vibe thickers, and for the Rescue I actually incorporated some of the Millie and June Thickers from a previous kit. I then cut one of the diamond stickers from the My Minds Eye Yes Please sticker sheet in half and put one half at both sides pointing inwards. I then finished this card off by using The Best Day sticker off the same sheet. 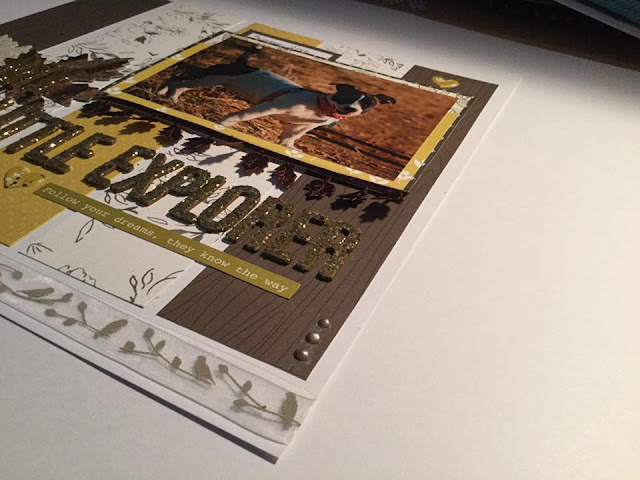 I didn't want to do a lot to this card because it was a full 6x4 photo (about a cm cut off the bottom and side to leave a border) of my neighbours dog Bertie. He came in first place at the dog show for "most adoring eyes." I attached one of the Simple Stories Posh clips that reads Today in the top right hand corner. 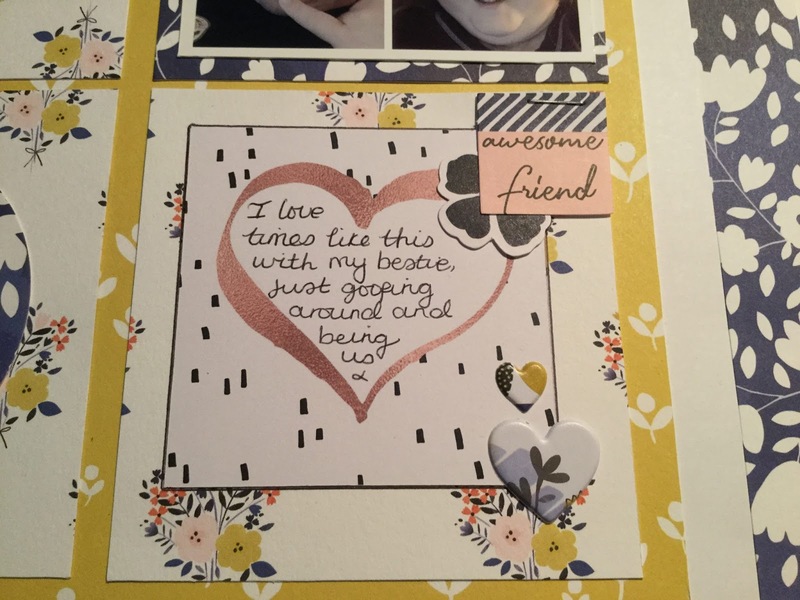 I then used one of the Labels from the Jumbo Label strip to do a little journalling and one of the Cake Walk Labels that reads You did it! perfect for this card! 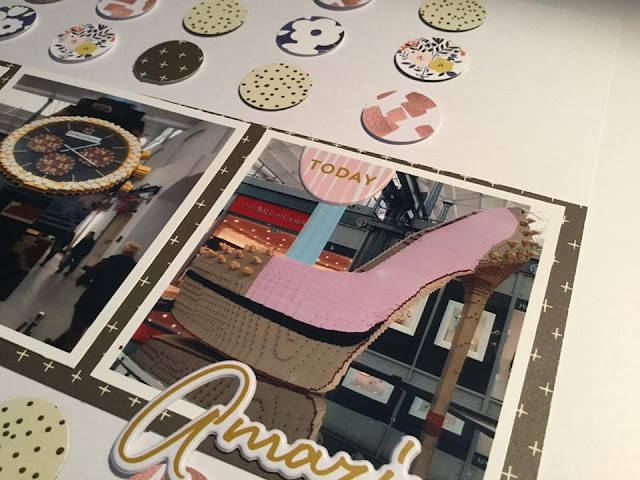 I finished off by cutting up the branding strip from the Hooray paper so I could add the Hooray to the photo. For pocket 3 I cut a strip of plain white cardstock and bullet pointed all the classes my puppy Enya was entered into. I lined two strips of the thin pink Reset Girl washi tape either side of it for a bit of interest. Pocket four was made using one of the Hooray Embellishment title cards reading Today is the day. I then used two of the stickers from the MAMBI My Life sticker sheet and one of the black and one of the silver Freckled Fawn Puffy Star stickers to finish off. Pocket five was made using 2 strips of the pink star ribbon that came in the embellishment kit and over the top I layered another one of the Hooray Cards from the Main kit...these were perfect sayings for this layout! It reads, This deserves a gold Medal! For Pocket six I cut up some more of the plain white cardstock to make a journalling box. 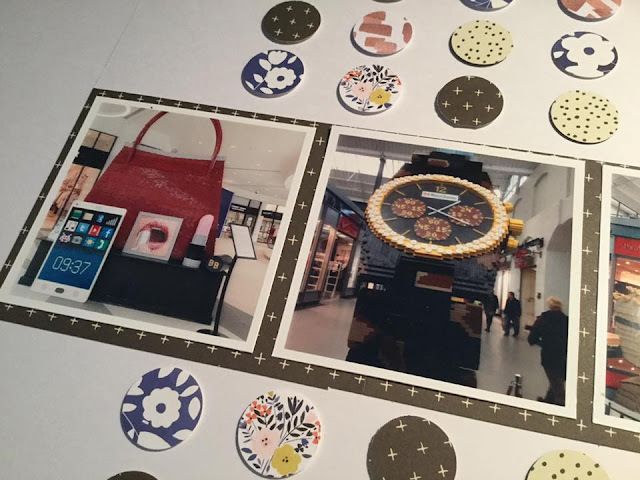 I used the Wonderful sticker from the MME Yes Please sheet and the little camera from the MAMBI My Life sticker sheet. My Baby Girl Enya! I made these 2 photos on an app called Pic Stitch and then printed them off using my Canon Selphy. She came 1st for Best Puppy under 12 months, and 3rd in the Waggiest Tail class! I was such a proud mummy. Because of the two photo's I felt this card didn't need much embellishing so I used the gold heart, the xoxo and The Very Best stickers all from the MME Yes Please sheet. I hope you like my layout. I was very pleased to be able to document this occasion into my Project Life album, It's something I can look back on and (maybe) add to if Enya win's more rosettes in the future. I will be back next week with some layouts from the new September/October kits so be sure to look out for that!